New vintage mic cables for mics utilizing screw-on, 3-pin Amphenol type connectors. These are super-high quality cables with a great 1 year warranty from manufacturer. They are well insulated and shielded, with an Amphenol type 3-pin screw-on connector on one end, and an all metal male XLR connector on the other for input to standard, modern mixers with XLR inputs. To use with a guitar amp input, simply use an adaptor! They will fit Astatic 77, early issue / original / discontinued series Shure, 55S, 55C, 55B, early issue / original / discontinued 55 series, PE55, 55SW, 51, 51S, 315, 530, 535, 556, 705 / 705A, DY-11, DY-45G and others, some older / early / original issue EV microphones such as the EV 630, EV-726, 731 Cardyne II, (may require slight modification to connector on cable) (note: Shure microphones with '3-pins' always have 'Pin-1' / ground 'in-line', or 'adjacent' to the key slot, where EV has "Pin-1" skewed a few degrees from it. 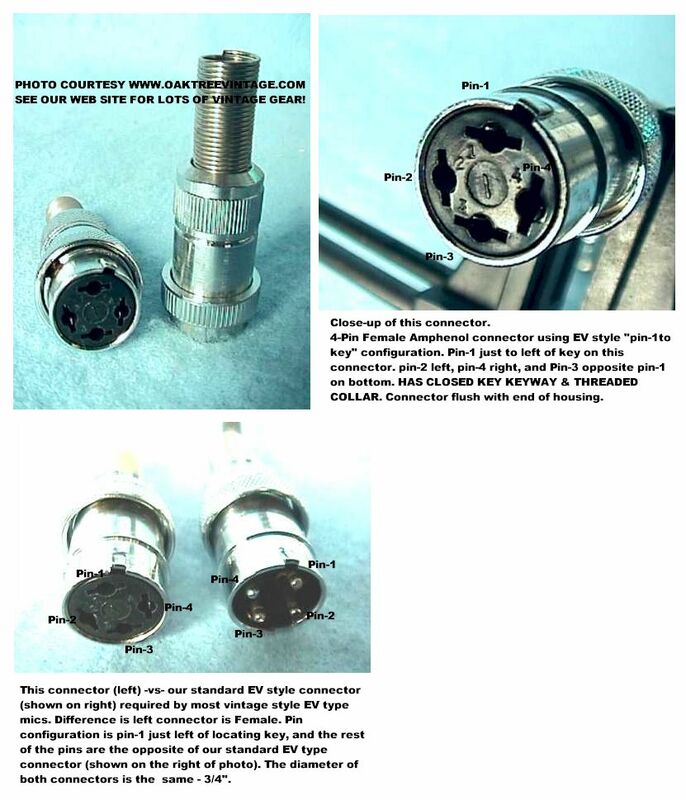 Just FYI and again, why we have to modify most of the "3-Pin" connectors for EV mics). Turner 22X, Turner U9S (no mod required), Stromberg-Carlson MD22A, and others utilizing a 3-pin, screw on Amphenol type (not for modern mics utilizing XLR connectors). Please verify that your microphone is working prior to ordering. If you need assistance doing this please just phone us. 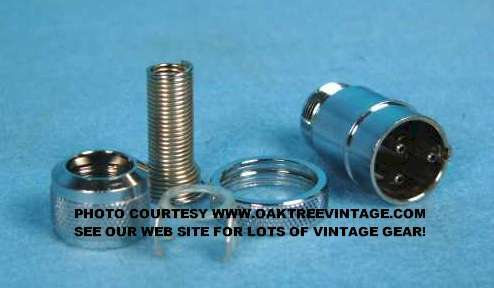 (As many of the connectors for 'vintage mics' are 'vintage / NOS' as well, they have likely been around for 30-60 years, and may show some surface corrosion / tarnish / scuffing, but this will only be cosmetic and will not affect performance. 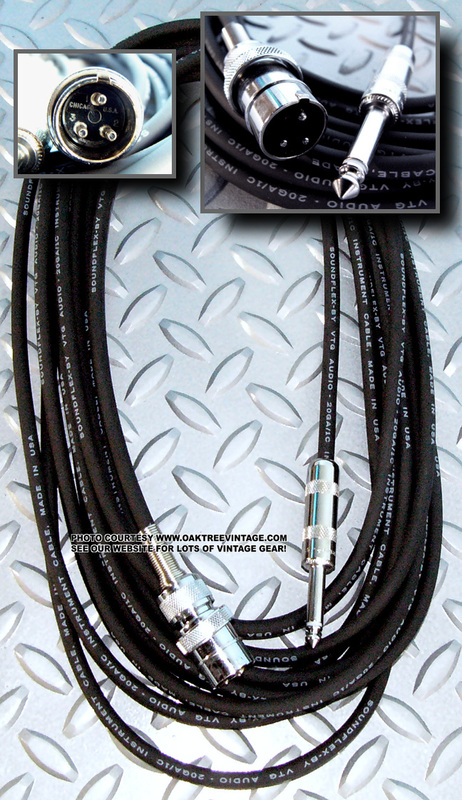 Cables / wire are new / fresh stock as well as the 280 & XLR plugs. New vintage mic cables for many (not all) EV (Electro-Voice) mics utilizing screw-on, 4-pin Amphenol type connectors. These are super-high quality cable with a great 1 year warranty from manufacturer. They are well insulated and shielded, with an Amphenol type 4-pin screw-on connector on one end, and an all metal, male XLR connector on the other for input to standard, modern mixers with XLR inputs. 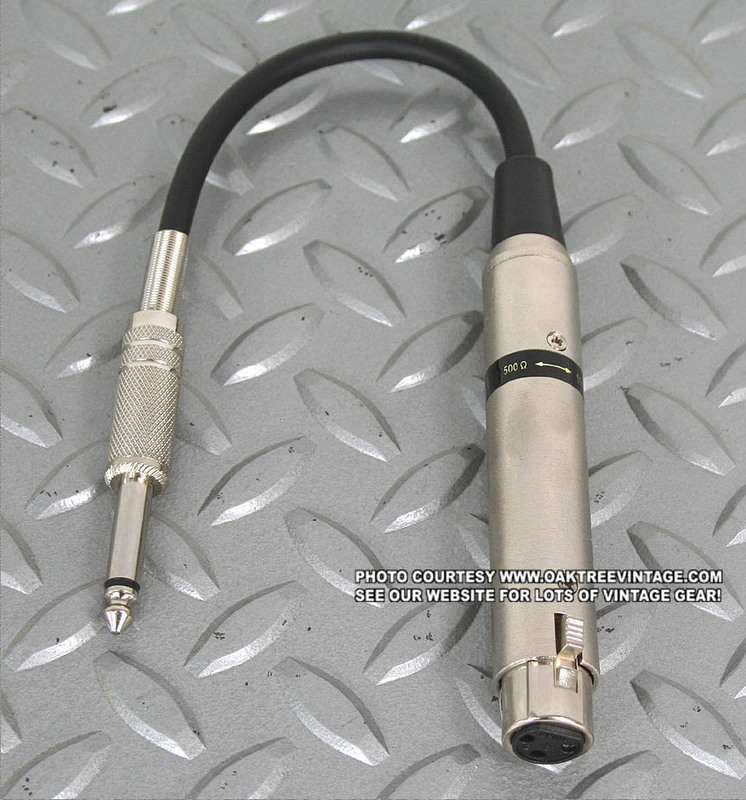 To use with a guitar amp input, simply use an XLR-1/4" adaptor! They will fit DuKane 7A160, EV / Electrovoice 77A, EV-623, EV 630, 636, 644, 664, 674, 676, EV-726, 767, Rauland 1248, Stromberg-Carlson MD37CS and most other EV utilizing a 4-pin, screw on Amphenol type. These will also fit, with a slight modification to the plug, some early / original issue Shure mics such as the Shure 545, 545S, 565S / Uni-Sphere / 'Pistol Grip' microphones (not for modern mics utilizing XLR connectors). Please verify that your mic is functioning prior to ordering cables. If you need assistance doing this please just phone us. 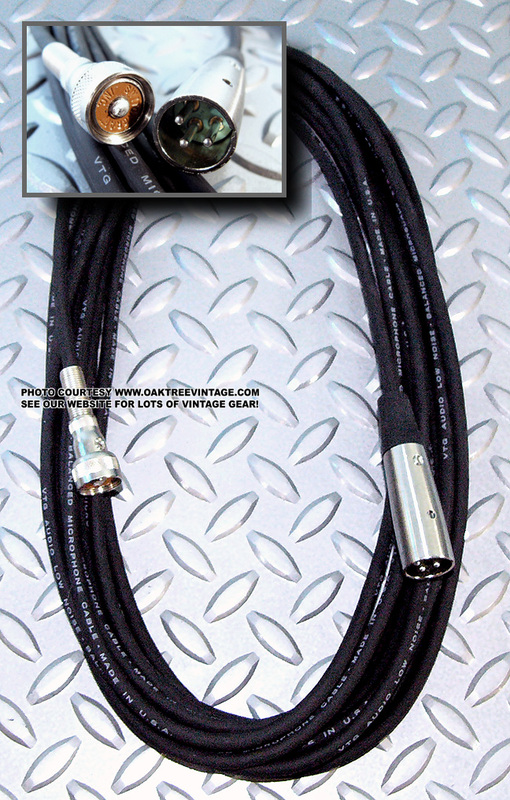 New vintage mic cables for microphones utilizing screw-on, 3-pin Amphenol type connectors. These are super-high quality cable with a great 1 year warranty from manufacturer. 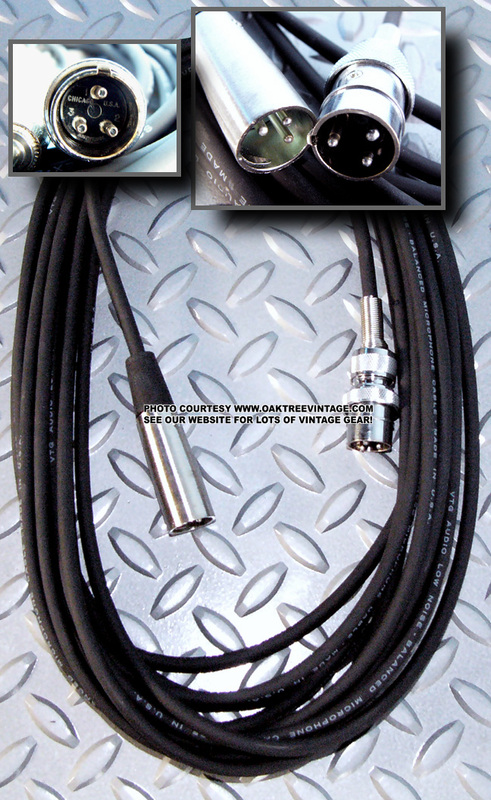 They are well insulated and shielded, with an Amphenol type, 91-MC3M, 3-pin screw-on connector on one end, and an all metal Neutrik 1/4" male "guitar / phono" plug connector on the other for input to standard guitar amps and mixers with 1/4" inputs. They will fit Astatic 77, early issue / original / discontinued series Shure, 55S, 55C, 55B, early issue / original / discontinued 55 series, PE55, 55SW, 51, 51S, 315, 530, 535, 556, 705 / 705A, DY-11, DY-45G and others, some older / early / original issue EV microphones such as the EV microphones such as the EV 630, 731 Cardyne II, (may require slight modification to connector on cable) (note: Shure microphones with '3-pins' always have 'Pin-1' / ground 'in-line', or 'adjacent' to the key slot, where EV has "Pin-1" skewed a few degrees from it. Just FYI and again, why we have to modify most of the "3-Pin" connectors for EV mics). Turner 22X, Turner U9S (no mod required), Stromberg-Carlson MD22A, and others utilizing a 3-pin, screw on Amphenol type (not for modern mics utilizing XLR connectors). 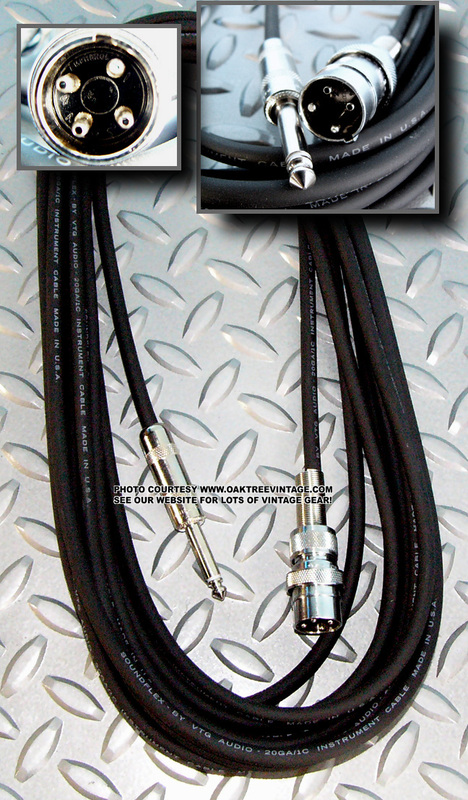 New vintage mic cables for EV Electro-Voice microphones and other utilizing screw-on, 4-pin Amphenol type connectors. These are super-high quality cable with a great 1 year warranty from manufacturer. 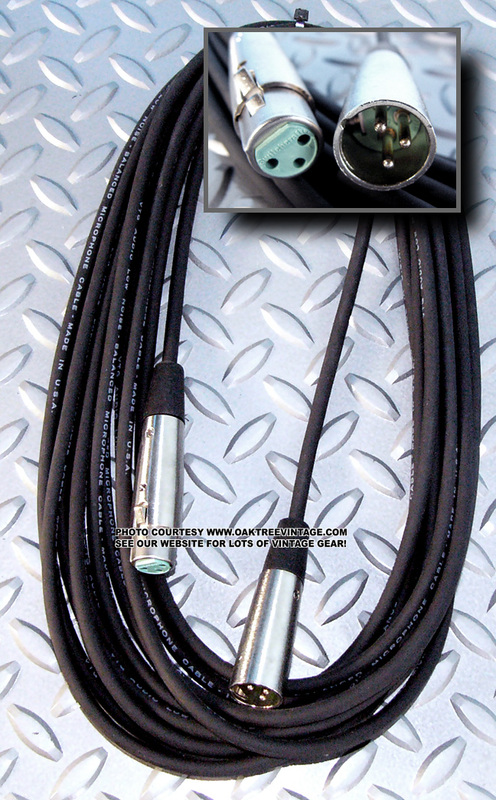 They are well insulated and shielded, with an Amphenol type, 91-MC4M, 4-pin screw-on connector on one end, and an all metal Neutrik 1/4" male "guitar / phono" plug connector on the other for input to standard guitar amps and mixers with 1/4" inputs. They will fit DuKane 7A160, EV / Electrovoice 77A, EV-623, EV 630, 636, 644, 664, 674, 676, 767, Rauland 1248, Stromberg-Carlson MD37CS and most other EV utilizing a 4-pin, screw on Amphenol type. These will also fit, with a slight modification to the plug, some early / original issue Shure mics such as the Shure 545, 545S, 565S / Uni-Sphere / 'Pistol Grip' microphones (not for modern mics utilizing XLR connectors). (note: Shure microphones with '4-pins' always have 'Pin-1' / ground 'in-line', or 'adjacent' to the key slot, where EV has "Pin-1" skewed a few degrees from it. Just FYI and again, why we have to modify most of the "4-Pin" connectors for Shure mics). 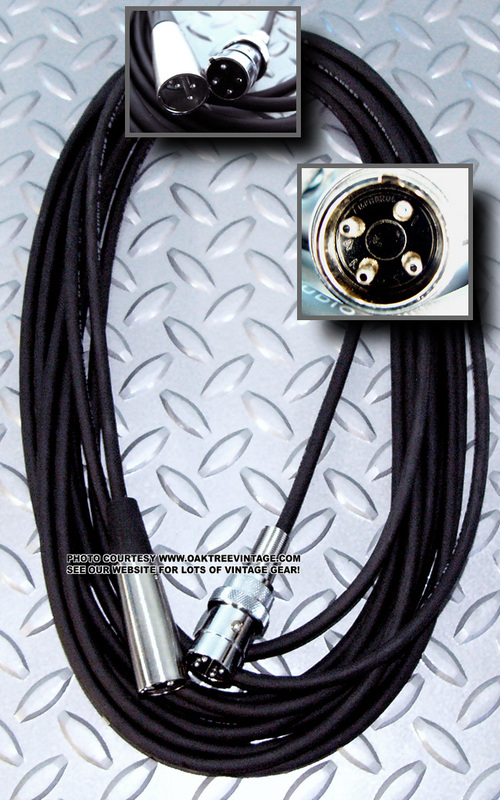 CABLE FOR VINTAGE MICS, HARP MICS, AMPS AND LAPSTEELS! New vintage mic cables for many older mics utilizing screw-on, center-pin Amphenol connectors ~5/8" in diameter. These are super-high quality cable with a great 1 year warranty from manufacturer. They are well insulated and shielded, with an Amphenol center-pin screw-on connector on one end, and an XLR male connector on the other for input to standard modern mixers and snakes. To use directly into a guitar amp simply use an adaptor, transformer, or direct box. 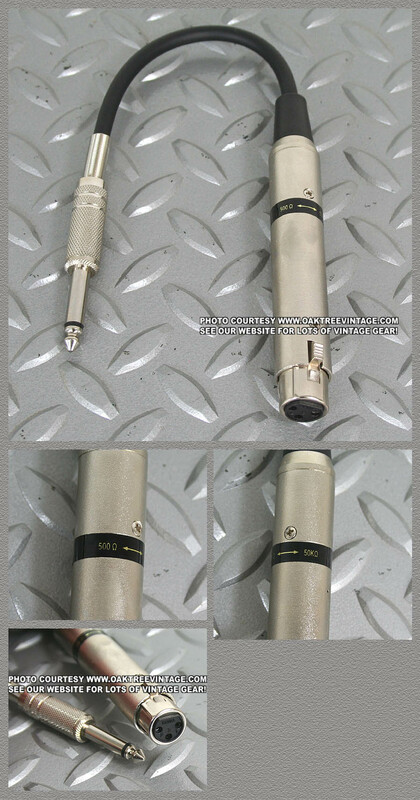 They will fit any microphone, pick-up, or any device utilizing a center-pin, screw on Amphenol type including Astatic JT-30, Turner S22D, 22X, and Turner 33D, some Americans, some vintage / original issue / discontinued Shure microphones such as the 535A, PE-585 PE585, some "PE" series, some 'Slim-X' series, such as the 777S microphones, vintage / original issue / discontinued EV 606, EV 611 Mercury, EV 630, EV 638, EV Cardax 950, EV-726 / CARDYNE I/II / 1/2, some Altec Microphones, American Microphones, Calrad DM-11, Calectro QA-150, and many, many others. (not for modern XLR mics). Please verify that your mic or pickup is functioning prior to ordering cables (not for modern mics utilizing XLR connectors). If you need assistance doing this please just phone us. New vintage mic cables for many older mics utilizing screw-on, center-pin Amphenol connectors ~5/8" in diameter. 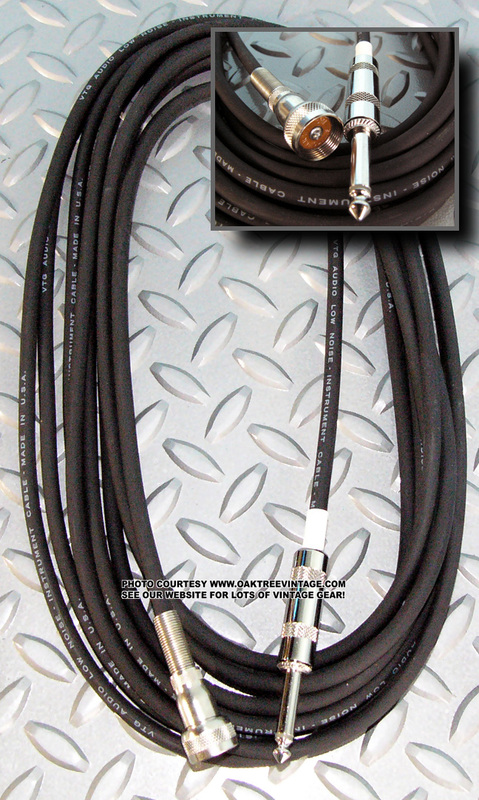 These are super-high quality cable with a great 1 year warranty from manufacturer. They are well insulated and shielded, with an Amphenol center-pin screw-on connector on one end, and an all metal Neutrik 1/4" male "guitar / phono" plug connector on the other for input to standard, modern mixers and guitar amps with 1/4" inputs. They will fit any microphone, pick-up, or any device utilizing a center-pin, screw on Amphenol type including Astatic JT-30, Turner S22D, 22X, and Turner 33D, some Americans, some vintage / original issue / discontinued Shure microphones such as the 535A, PE-585 PE585, some "PE" series, some 'Slim-X' series, such as the 777S microphones, vintage / original issue / discontinued EV 606, EV 611 Mercury, EV 630, EV 638, EV Cardax 950, EV-726 / CARDYNE I/II / 1/2, some Altec Microphones, American Microphones, Calrad DM-11, Calectro QA-150, and many, many others (not for modern mics utilizing XLR connectors). (note: Shure microphones with '4-pins' always have 'Pin-1' / ground 'in-line', or 'adjacent' to the key slot, where EV has "Pin-1" skewed a few degrees from it. Just FYI and again, why we have to modify most of the "4-Pin" connectors for Shure mics). Cable for modern XLR mics such as EV N/D 257, 357, 457, 757, PL Series, EV DS35, 635, RE-38, RE-10, RE-20, AKG C-3000, C-1000, 414, D-190E, D-1000, D-1200E and hundreds of other models. If your mic uses utilizes an XLR connector then this cable will work. These are not "Cheap" cables. I do not use or sell "Cheap" cables. If your number one priority is to save money, in the short run, then that's what you should do. Save your money. If you want to buy a mic cable you can finally rely on show after show, then THIS IS THE CABLE!!! I have sold literally thousands of these and have only had maybe a dozen come back. They are fitted with the more expensive Switchcraft brand plugs on both ends and are hand made in the USA with a LIFETIME warranty! * If it fails due to workmanship or parts failure, just send it back and it will be repaired or replaced with a new comparable unit! * Just send it back and we'll either repair it or at our option, send you a new one. * Your show is important. Too important to trust to cheap, intermittent cables. I can't tell you how many times I have seen a $30,000 sound system brought to it's knees by one $3 cable. * Warranted against defects in original workmanship, but not against abnormal use / abuse, ie; cut cable, bent plug or cables eaten by dogs, cats or other family members. **Shipping to lower 48 US states. Other locations calculated separately. Finally we found an XLR-1/4" transformer / adaptor that doesn't "gut" itself after you use it a half dozen times. I can't tell you how many times I've used cheap versions of these in the past at gigs, that totally come apart when you un-plug them. This one is built to last and stay together. This version is also the "pig-tail" one that doesn't turn your microphone cable plug into an '8" lever' like the "solid" versions do. With the cheap way mixing boards / consoles, portable PA systems and guitar amps are made these days, you need all the help you can get. Any tension on the solid, "one-piece" versions will bend your input jacks and stress the 'direct to circuit board' solder connections. This version puts no more tension on your input jacks than a normal cable does. Internal, built-in transformer converts Low Z (600 ohms) to Hi Z (50,000 ohms) to allow all your mic's sound into your pre-amp / amp. It's essentially a Direct-Box in a cable. 1 year warranty against workmanship defects*. New "Amphenol" style 3-pin 91-MC3M Microphone cable connectors. They will fit Astatic 77, early issue / original / discontinued series Shure, 55S, 55C, 55B, early issue / original / discontinued 55 series, 55SW, 51, 51S, 315, 530, 535, 556, 705 / 705A, DY-11, DY-45G and others, some older / early / original issue EV microphones such as the EV 630, EV-726, 731 Cardyne II, (may require slight modification to connector on cable) (note: Shure microphones with '3-pins' always have 'Pin-1' / ground 'in-line', or 'adjacent' to the key slot, where EV has "Pin-1" skewed a few degrees from it. Just FYI and again, why we have to modify most of the "3-Pin" connectors for EV mics). Turner 22X, Turner U9S (no mod required), Stromberg-Carlson MD22A, and others utilizing a 3-pin, screw on Amphenol type (not for modern mics utilizing XLR connectors). 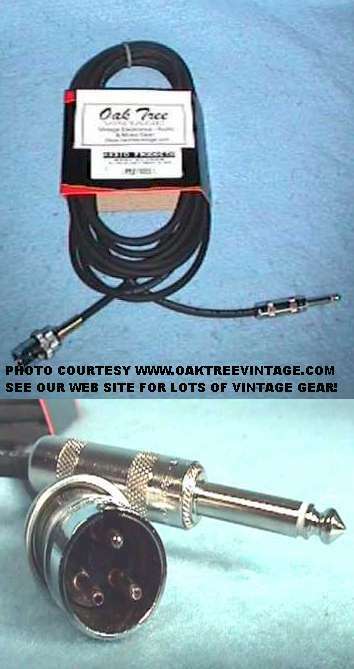 This connector was also used on the 'Stancil Hoffman' "MiniTape / Spy Suitcase" Reel to Reel player / Recorder for signal in and out to the Record / Play head. (We do not have any technical info at this time, but would assume, based on other mfg's use of 'Pin-1' that it would be 'Ground' and that the other two pins would be 'In & Out', but we have no info as to which. Those pins likely go directly to the 'Tape Head' as it does not appear that the unit has a 'Record / Playback Amplifier' built in, but that's all speculation at this point). They are available in very limited quantities and when they're gone we don't know when we will have access to more. New old stock Amphenol 4-pin 91-MC4M Microphone cable connectors. They will fit DuKane 7A160, some some older / early / original issue EV models 77A, 623, 636, 644, 664, 674, 676, 726, 767 and others, Rauland 1248, Stromberg-Carlson MD37CS microphones and others utilizing a 4-pin, screw on Amphenol type connector. These will also fit, with a slight modification to the plug, some early / original issue Shure mics such as the Shure 545, 545S, 565S / Uni-Sphere / 'Pistol Grip' microphones (not for modern mics utilizing XLR connectors). (note: Shure microphones with '4-pins' always have 'Pin-1' / ground 'in-line', or 'adjacent' to the key slot, where EV has "Pin-1" skewed a few degrees from it. Just FYI and again, why we have to modify most of the "4-Pin" connectors for Shure mics). "EVEN RARER THAN HENS' TEETH"
No, we don't know what these fit, so study the photos and your mic or connector closely. New old stock Amphenol 3-pin MALE 91-MC3M1 Microphone cable connectors. They are in limited quantities and when they're gone we don't have a source more. We do not know what mics / connectors they will fit, so look VERY CLOSELY and STUDY the above photos. They are not for standard, early / original issue / vintage Shure mics such as the Shure 55 series, 51, 500, 315 etc. (we do not have that connector separately, only as a complete cable) but they do use the same 91-MC3M Amphenol Pin configuration of Pin-1 directly under the keyway. These are in very limited quantities and when they're gone, they're gone (not for modern mics utilizing XLR connectors). If anyone has any info as to models these connectors fit or proper model number feel free to let us know. Thanks. Just figured out that the inside, bakelite part of this will replace your broken / busted / chipped internal connector on EV mics with 4-pins, such as the EV 664! (not for modern mics utilizing XLR connectors). We have actually repaired a few EV 664's with the insert from this connector. If anyone has any info as to other models these connectors fit or proper model number feel free to let us know. Thanks. No, we don't know too many microphones these fit, so study the photos and your mic or connector closely. New old stock Amphenol 3-pin FEMALE 91-MC3F Microphone cable connectors. They are in limited quantities and when they're gone we don't have a source more. Beyond some American mic models such as the American D5, D9 and variations, do not know what mics or connectors they will fit, so look VERY CLOSELY and STUDY the above photos. They are not for standard, early / original issue / vintage Shure mics such as the Shure 55 series, 51, 500, 315 etc. (we do not have that connector separately, only as a complete cable) but they do use the same 91-MC3M Amphenol Pin configuration of Pin-1 directly under the keyway (not for modern mics utilizing XLR connectors). These are in very limited quantities and when they're gone, they're gone. These will couple with a standard 91-MC3M connector. We don't know what else it will fit. New old stock Amphenol 3-pin FEMALE 91-MC3F1? Microphone cable connectors. 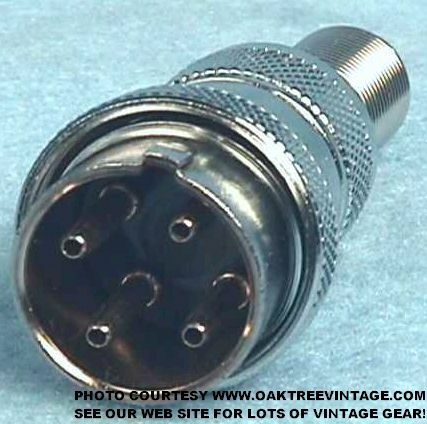 There is very limited supply of this style connector. We do not know what mics or connectors they will fit, so look VERY CLOSELY and STUDY the above photos. They are not for standard, early / original issue / vintage Shure mics such as the Shure 55 series, 51, 500, 315 etc. 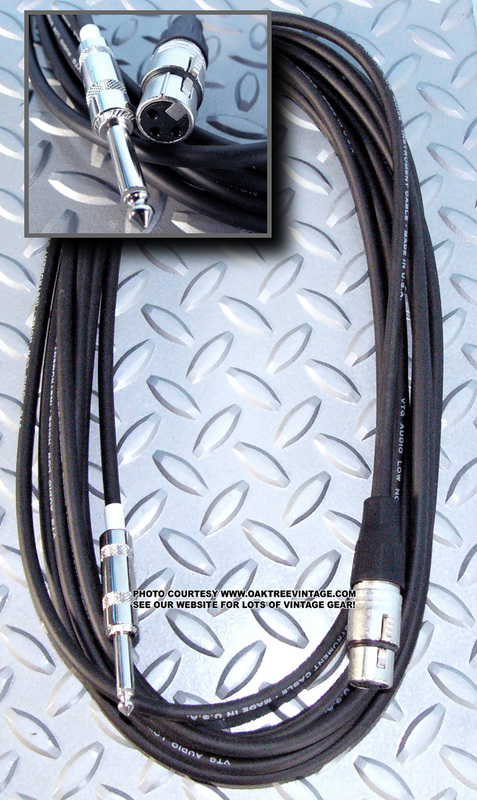 (we do not have that connector separately, only as a complete cable), but they do use the same Amphenol 91-MC3M Pin configuration of Pin-1 directly under the key and will mate up with our standard 3-Pin Shure / Amphenol 91-MC3M cable connectors (not for modern mics utilizing XLR connectors). These are in very limited quantities and when they're gone, they're gone. 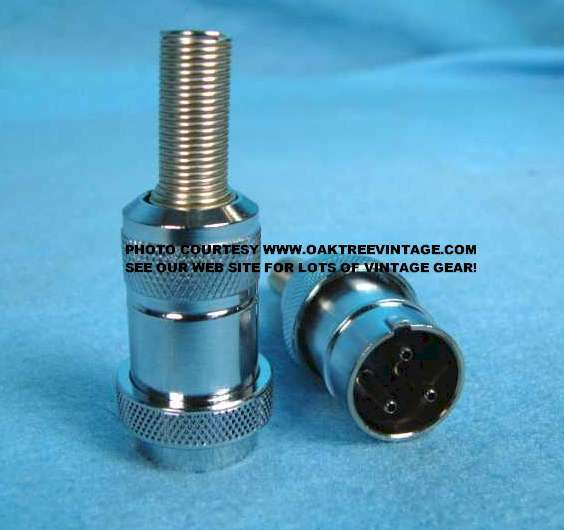 New info; We have been informed that this connector possibly fits the Astatic T-3 microphone. These cables and / or connectors are not made by any of the above listed "Microphone Manufacturers". Brands listed above are protected trademarks / properties of the respective companies mentioned. Oak Tree Enterprises, LLC is not affiliated with any of the above "Microphone" companies.